Guests can now book reservations for Universal’s Cabana Bay Beach Resort, the new, 1800-room hotel at Universal Orlando Resort that will feature value-priced guest rooms and moderately priced family suites. The hotel is scheduled to open in early 2014 – with reservations now being accepted for stays beginning on March 31, 2014. 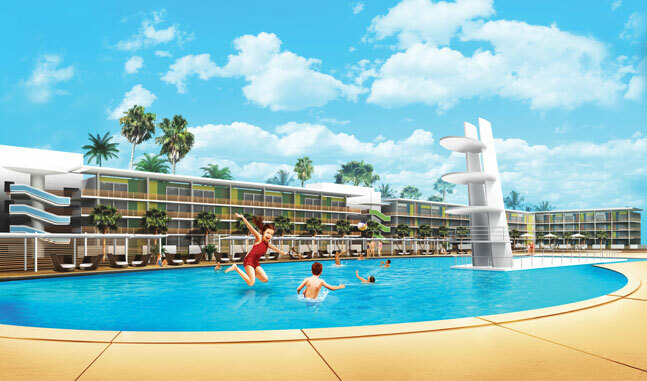 The new hotel is the fourth hotel within Universal Orlando Resort and will evoke the classic, retro-feel of iconic beach resorts from the 1950s and 60’s. An area located around the North Courtyard will open first, followed later in 2014 by an area located around the South Courtyard. Each area will have a unique look and feel. Families will have two options for experiencing the hotel – a value-priced standard guest room or a moderately priced, 430-square-foot family suite that sleeps six. From the moment they arrive, they will be surrounded by the hotel’s bold design, period colors, neon and retro feel. 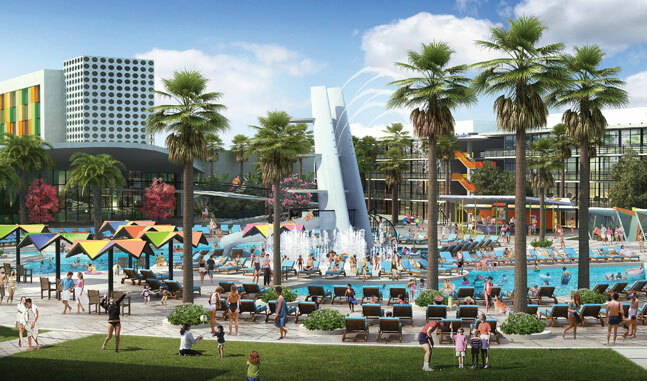 When complete, there will be two pool complexes with sand beach and interactive features, a themed lazy river experience and 10-lane bowling alley. Family suite rates will begin at $174 per-night; standard room rates will begin at $119 per-night. Package rates are available with savings based on length-of-stay; a family of four can stay for seven nights for $47 per person, per-day – including accommodations and tickets to both Universal Orlando theme parks. As with all Resort hotels, guests at Universal’s Cabana Bay Beach Resort will be just a brief walk from Universal Orlando and Islands of Adventure as well as Universal CityWalk. 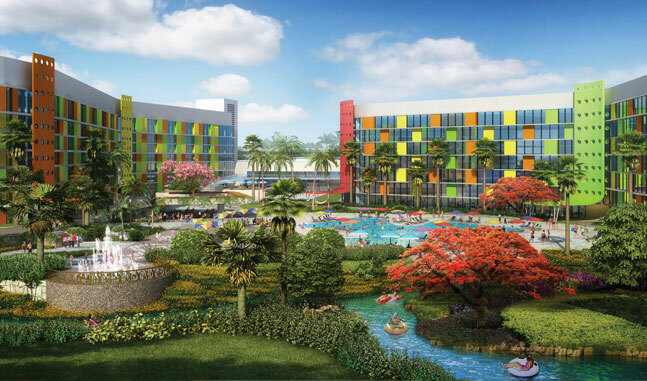 They will enjoy benefits that include Early Theme Park Admission, complimentary shuttle bus transportation to the theme parks and Universal CityWalk, complimentary delivery of merchandise purchased throughout the resort to their hotel and resort-wide charging privileges with their room key. Guests can upgrade to one of Universal Orlando’s three deluxe hotels for additional benefits – including complimentary Universal Express Unlimited ride access. Those hotels are Loews Portofino Bay, the Hard Rock Hotel and Loews Royal Pacific Resort. Each of Universal’s Cabana Bay Beach Resort’s Courtyards will have a unique design and atmosphere. 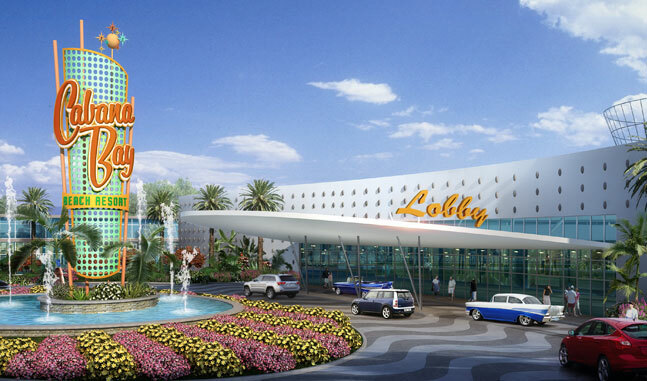 They will share a highly themed, two-story arrival building that will also be home to a food court serving traditional American classics along with an ever-changing selection of international cuisine, a 10-lane “retro” bowling alley, a game room and a fitness center. First to open, the North Courtyard and its 600 family suites will be inspired by the sweeping motor courts of the 1950s and 60s. It will feature four-story buildings with open corridors and direct access to guest rooms. Each of the 600, 430-square-foot suites will sleep up to six and include a fold-out foam bed, kitchenette, a sliding partition for privacy, two flat-screen TVs, and an extra-large bathroom with preparation spaces for three people at once. The suite buildings will surround a more than 10,000-square-foot, zero-entry pool with a 100-foot water slide, waterfall features and 4,000-square-foot interactive play area. Cabanas will be available to guests for rent, and lounge chairs will ring the deck, backed by zones for sunning, game playing, picnicking and relaxing on the grass. To book your stay at Universal’s Cabana Bay Beach Resort, contact your Kingdom Magic Travel Agent today! This entry was posted in Islands of Adventure, Universal Orlando Resort, Universal Studios Orlando and tagged beach resorts, bold design, cabana, design period, interactive features, lane bowling alley, lazy river, new hotel, norsworthy, north courtyard, orlando theme parks, period colors, resort hotels, river experience, room hotel, sand beach, seven nights, universal citywalk, universal orlando resort, universal orlando theme parks on May 26, 2013 by John Donahue.